As software vendors expand their products' functionality, it's getting harder to tell the different warehousing platforms apart. Here's what you need to know to make the right buying decision. It used to be that you could navigate the warehouse software market without the aid of a map. There were three principal types of software, each handling a clearly defined set of functions that were distinct from those handled by the others. But in recent years, that has changed. 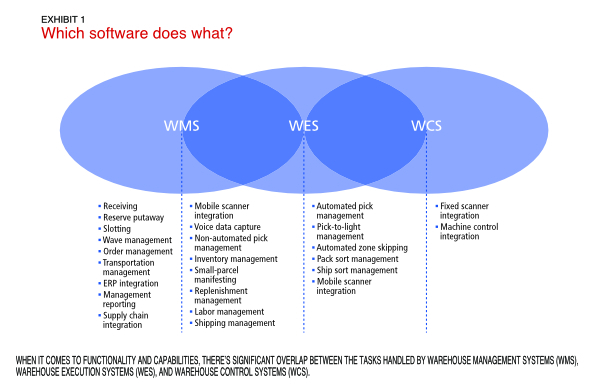 The lines between the three types of warehouse systems—warehouse management systems (WMS), warehouse control systems (WCS), and warehouse execution systems (WES)—have blurred, making the warehouse software waters decidedly muddied and difficult to chart. As the software application that controls the movement and storage of materials within the warehouse, the WMS has been around for about 40 years and is the most mature of the three options. By managing the mechanical material handling equipment within the warehouse, the WCS provides a valuable function and basically picks up where the WMS leaves off in an automated environment. The WES plays in a gray area, acting in some respects like a "WCS on steroids" and managing some functionality that is traditionally handled by a WMS. To understand how the market has evolved, it helps to know a little bit about its history. In the past, companies used WMS as the overarching solution to run their warehouses, and WCS to interface with the machines in that warehouse. These were two distinct systems. Over the last 10 years, however, both WCS and WES providers have improved their products to the point where some look and act like WMS. By enhancing WCS and using creative marketing messages to sell their systems, software vendors have both opened up opportunities for user companies and made the software selection process more confusing for them. On the plus side, some WCS and WES providers have standardized their products, developed new versions, and enhanced their offerings. By using a common underlying code base from one project to the next (instead of a series of custom-built applications), they can roll out system enhancements to all users at once. These are all benefits for companies that have a non-customizable WMS in place or that are using a WCS and need greater functionality. On the minus side, these developments have led to some market confusion. Because it's getting harder to discern among the choices—and because more vendors are pitching their products as the "complete solution" to a client's warehouse management challenges—selecting the right solution (or solutions) is becoming more difficult for buyers. There are also more opportunities to try to put a "square peg in a round hole," if you will, by using software that's really not capable of handling specific functions in a sustainable manner. Further complicating the picture, companies find themselves in a variety of situations with respect to the warehouse software acquisition process, making it impossible to provide a universal set of purchasing guidelines. Some are buying a new WMS and material handling systems at the same time, while others are buying new material handling equipment and a WCS, but not a WMS. 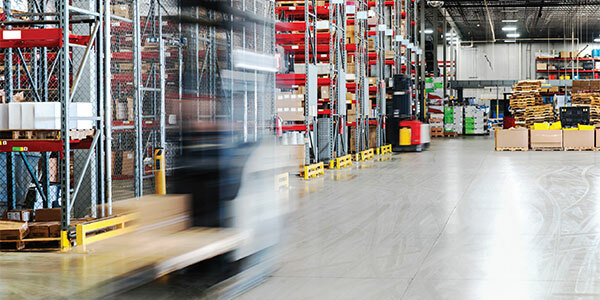 Still others either want to replace their WMS or need software that can better manage advanced warehousing functionality (e.g., directed putaway or waving) but aren't interested in replacing their WMS or material handling equipment (and WCS). 1. Companies purchasing a new WMS and material handling equipment at the same time. With many WMS installations hitting or passing the 10-year mark, companies in search of better functionality and capabilities may be acquiring a WMS and buying new material handling equipment simultaneously. The best bet in this case is to purchase a WCS or WES system from the same company that provides the material handling equipment, thus creating a single point of accountability. (This supplier could be an integrator or an equipment manufacturer.) At the same time, these companies should guard against trying to force the WCS or WES system to manage functions that lie outside of the system's prescribed design. Instead, they should seek out sensible opportunities where the WCS or WES can manage functionality and take some of the load off the WMS (but not serve as a substitute for that WMS). In other words, acquire a bona fide WMS and then let each system do what it does best. 2. Companies buying new material handling equipment and a WCS, but not a WMS. Other companies may be replacing their material handling systems but keeping their existing WMS intact. This presents a great opportunity to acquire a robust state-of-the-art WES that can potentially plug some of the functionality gaps that exist within the current WMS. We see this as one of the limited situations where it probably makes sense to purchase a true WES—a strategy that's easier than attempting to customize a WMS—and gain some functionality in the process. As with scenario #1, however, we recommend purchasing a WES from the same company that provides the material handling equipment. 3. Companies that only want to replace an existing WMS. A company that already has a material handling system and WCS/WES in place, but that wants to replace the WMS, is probably the most likely to be confused by the options on the market today. In fact, we disagree with some of the marketing claims being made—namely, that a WES can handle 95 percent of what a typical WMS handles and do it for less money. We're also skeptical of WCS/WES providers' claims that if their clients already own a software license, they can customize and configure that software to meet the client's needs. While it may be possible to take a WCS/WES and make it handle nontraditional functions (e.g., receiving, putaway, cycle-counting, and picking on handheld devices), most WCS/WES providers do not have a track record to prove continued commitment to developing and managing their products—at least to the same extent that WMS providers have. Companies may be able to get a system customized and to the "go live" stage, but the odds are high that they'll wind up with a legacy system that can't be easily upgraded. A much better approach is to go out and purchase an overarching WMS that's built and designed to manage end-to-end processes within the warehouse or DC. 4. Companies seeking software that can better manage their existing material handling equipment but that don't want to replace their WMS. In this final scenario, the company has both a WMS and some form of material handling control software in place, but wants to add a WES to the equation in order to gain better control over its material handling equipment. This isn't a common situation, but it does happen. In this scenario, we recommend searching for a best-of-breed WES system and not feeling constrained by the need to purchase this system from the same company that provided the material handling equipment. Because there's not as much risk involved on the accountability side (for the end result), it's OK to talk to pure WES providers and then layer the software on top of the existing equipment. In return, companies will gain newer, better functionality without having to replace their material handling systems. With the lines between WMS, WCS, and WES continuing to blur, and with more operations looking to maximize their current systems while adding new capabilities in the warehouse, companies should take a good look at their own functional requirements before making any buying decisions. What functionalities do you need? What are the problems with your existing systems? How stable are these systems? By developing a functionality wish list before going too far down the software acquisition path, software buyers will be in a good position to evaluate providers and make the best decisions for their individual operations. Editor's note: Ian Hobkirk is the founder and managing director of Commonwealth Supply Chain Advisors as well as a blogger for DC Velocity. His blog, Getting it right in the distribution center," can be found here.